Turns out, our planet is bearing the brunt. The production of clothing itself demands massive amounts of valuable resources, fuel and water—it can take up to 700 gallons of water to make just one t-shirt. And along with lower prices, the quality of apparel has dropped dramatically over the past few decades. This means more and more pieces of clothing are worn and washed just once or twice before being thrown out, resulting in approximately 14 million tons of textile waste each year. Workers across the globe are also seeing the unfortunate affects of fast fashion—particularly in countries like Bangladesh. The city of Dhaka is crammed with factories producing unprecedented volumes of clothing and accessories to satisfy the American appetite for affordable fashion. In 2013, despite warnings about structural weakness, garment workers were told to report to their jobs at Rana Plaza, and the eight-story building collapsed, killing over a thousand people including child workers, and trapping and injuring thousands more. And while steps have been taken locally and internationally since the tragedy, including safety regulations and child labor protections, the poor working conditions in many factories remain. Workers are paid very little, and endure long hours in tight spaces. Many are also exposed to the safety hazards of chemicals, dyes and heavy machinery without proper attire and equipment (not even shoes in some cases). The good news? 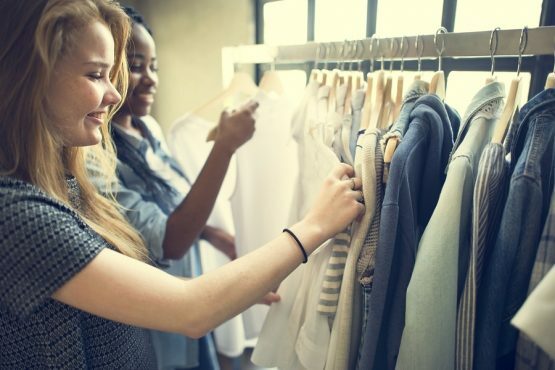 There are things you can start doing today to help minimize the affects of fast fashion. Here are a few of them. Buy quality over quantity. (Not the other way around.) When you decide to make a purchase, think about it as a long-term investment. If it costs $10, chances are, you’re not getting a very high quality item—so be willing to pay more than you’re used to. Check the labels and see where the piece was made. Inspect the seams and assess the quality of the fabric. You’ll typically find good quality at smaller, local stores, and when buying direct from designers. Take up sewing. How can you get more wear out of your wares? Learn how to sew. Stitching seams, reattaching buttons and patching up holes is a simple way to reduce waste. Search second hand. Seek out thrift stores. It’s not only economical for you, but puts garments that may end up in landfills to good use. Love shopping online? Companies like Thred Up will pay you for your clothing (they even send you the bag to put them in!) and then you can purchase what others may have purged from their closet at low cost. Support social- and eco-conscious companies. Before you pull out that credit card, do a little research. There are plenty of fair trade and ethical brands and businesses to buy from. Find out where are their clothes made and what materials they use. See if they support sustainable practices. When consumers create a demand for responsible companies, more will follow suit. Spread the word! Awareness if the first step to real change. How can friends and family make better buying decisions if they don’t know fast fashion is a problem? Here in Utah, at least Salt Lake, we have the Deseret Industries or the DI. Out of everything donated, especially the clothes, the better half gets sent to those in need and the rest gets sold and the money goes back to help the workers at the DI learn job skills. I think that clothes should be cheaper and less expensive because this century of families cannot afford clothes, food, and a home.